We have learnt that acids turn blue litmus red and bases turn red litmus blue. Let us see what happens when an acid is mixed with a base.We are going to use an indicator you have not used so far. It is called phenolphthalein. Fill one fourth of a test tube with dilute hydrochloric acid. Note down its colour. Note down the colour of phenolphthalein solution also. Add 2-3 drops of t he indicator to the acid. Now shake the test tube gently. Add to the acidic solution a drop of sodium hydroxide solution by a dropper. Stir the tube gently. Continue adding the sodium hydroxide solution drop by drop while stirring till the pink colour just appears. Now add one more drop of dilute hydrochloric acid. The solution again becomes colourless. Again add one drop of sodium hydroxide solution. The solution again becomes pink in colour.It is evident that when the solution is basic, phenolphthalein gives a pink colour. On the other hand, when the solution is acidic, it remains colourless. When an acidic solution is mixed with a basic solution, both the solutions neutralise the effect of each other. When an acid solution and a base solution are mixed in suitable amounts, both the acidic nature of the acid and the basic nature of the base are destroyed. The resulting solution is neither acidic nor basic. Touch the test tube immediately a fter neutralisation . In neutralisation reaction, heat is always produced, or evolved. The evolved heat raises the temperature of the reaction mixture. The reaction between an acid and a base is known as neutralisation. Salt and water are produced in this process with the evolution of heat. Our stomach contains hydrochloric acid. It helps us to digest food. 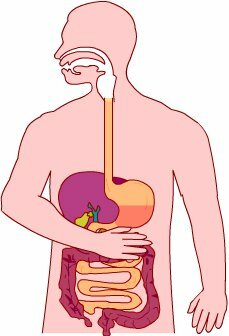 But too much of acid in the stomach causes indigestion.Sometimes indigestion is painful. To relieve indigestion, we take an antacid such as milk of magnesia, which contains magnesium hydroxide. It neutralises the effect of excessive acid. The sting of an ant contains formic acid. When an ant bites, it injects the acidic liquid into the skin. The effect of the sting can be neutralised by rubbing moist baking soda (sodium hydrogen carbonate) or calamine solution, which contains zinc carbonate. Excessive use of chemical fertilisers makes the soil acidic. Plants do not grow well when the soil is either too acidic or too basic. 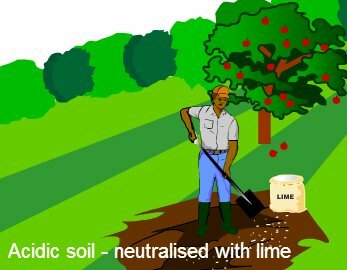 When the soil is too acidic, it is treated with bases like quick lime (calcium oxide ) or slaked lime calcium hydroxide . If the soil is basic, organic matter is added to it. Organic matter releases acids which neutralises the basic nature of the soil. The wastes of many factories contain acids. If they are allowed to flow in to the water bodies, the acids will kill fish and other organisms. The factory wastes are, there fore, neutralised by adding basic substances. Substances which are neither acidic nor basic are called neutral. 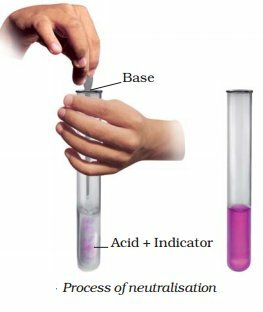 Solutions of substances that show different colour in acidic, basic and neutral solutions are called indicators. An acid and a base neutralise each other and form a salt. A salt may be acidic, basic or neutral in nature.